Finance Minister Arun Jaitley, in his reply to the discussion on the Finance Bill, has pointed again to the small direct tax base. Detailed tax data for 2012-13 showed that the picture has changed little from the 1990s, when only 1% of Indians were in the direct tax net. Mr. Jaitley has presented data on the large sums of money deposited into some bank accounts post the demonetisation of November 8, 2016. The implication is that these may be black funds and they are being tracked and the people behind them will be caught. The secretary of the Income Tax Gazetted Officers Association has written to the Central Board of Direct Taxes Chairperson that the top leadership has issued directions, at times hourly, leading to confusion and indecision and to spoiling the image of the tax department. Officers have exerted pressure on taxpayers via email, SMS and summons. In spite of all this, apparently little black income has been declared. In the Budget speech, the Finance Minister stated, “Deposits of more than Rs.80 lakh were made in 1.48 lakh accounts with average deposit size of Rs.3.31 crore… deposits between Rs.2 lakh and Rs.80 lakh were made in about 1.09 crore accounts with an average deposit size of Rs.5.03 lakh.” These two add up to about Rs.10 lakh crore. Thus, two-third of the total of Rs.15 lakh crore of old notes returned to the banks were accounted for by 1.1 crore accounts. Even if one or two lakh crores of this sum proves to be black (after years of litigation, etc. ), this would hardly dent the black economy generating Rs.93 lakh crore in 2016. Many businesses such as petrol stations and hospitals generate a lot of daily cash. They were allowed to use old currency notes; every day, they would have deposited lakhs of rupees, and over a month, crores. Businesses hold working capital and cash in hand which, depending on the size of the business, could be substantial. Mr. Jaitley has stated that there are “5.6 crore informal sector individual enterprises and firms doing small business”. Such small businesses work mostly in cash and, therefore, may hold fairly large sums of it. He has also said that there are 13.94 lakh registered companies as of March 31, 2014. Of these, 5.97 lakh filed tax returns but 2.76 lakh of them showed a loss or zero income. Companies not filing returns or running at a loss or at zero profit also hold cash — to hire labour, buy inputs, spend on overheads. The number of businesses mentioned by the Finance Minister and the crores of farmers together could legitimately hold about Rs.9 lakh crore of cash in hand. The remaining Rs.8.5 lakh crore of currency in circulation in October 2016 would have been with households. The government has said it would use ‘data mining’ to figure out whether the large deposits in accounts are consistent with their declared incomes. This will be a difficult exercise at best. Cash as working capital has to be distinguished from cash as saving from income. Every household keeps some money for day-to-day requirements and for emergencies. The 26 crore Indian households could hold about Rs.5.5 lakh crore for these purposes. The balance of the currency in circulation, another Rs.3 lakh crore, could be held as black savings. Since about four crore people generate substantial black incomes, the average cash holding of this group would be Rs.75,000. Not a huge sum of money. 1. Which one is correct regarding passage? 1. Mostly Indians pay direct tax. 2. Very little change in the percentage of direct taxpayers from 1990s. 3. In 1990s more people used to pay direct tax than now. 1. Spoiling the image of tax department. 2. Making a good image of tax department by giving regular direction. 3. Getting huge black income declared. 3. According to the author, which is false ? 1. The amount of black money recovered is not an enough amount. 2. Business which holds cash on daily basis can easily deposit crores of cash in account which can be black money. 3. Small sector holds their capital as cash so it can not be black money. A) These company doesn’t pay tax. B) These company give false information to save tax. D) To spend on overheads and labours and inputs. 5. How would government get to know about black money deposited in banks? A) Government will see the all accounts with large deposits. B) Government will use data mining to see all accounts with large cah deposit and their consistency. C) Government will distinguish between cash as working capital cash as saving. D) Government will consider all money which is not stated earlier as black money. Directions (7 – 10): Choose the word/group of words which is MOST OPPOSITE in meaning of the word/group of words printed in bold as used in the passage. 1. B) In 1990s there were 1% direct taxpayers which is almost same with 2012-13 data. 2. A) By changing norms and guidelines regularly it spoil the image of tax department. 3. C) Cash to the small business may or may not be black money because author have not mentioned about that. 5. B) Government will use data mining to see whether there is black money or not. 6. C) Legitimately means which is in law. 7. E) Litigation means legal process. 9. A) Substantial means something which is important. 10. D) Indecision means not to take decision. 1. A can do a piece of work in 18 days and B can do the same work in 12 days. A and B starts the work together but after 3 days B leave the job and C join with A. A and C complete the remaining works in 3 days. If for complete work Rs 24000 has been given, then what amount is received by C? 2. Ananya bought a bag with an additional 20% discount on the reduced price after deducting 10% on the labelled price. If the labelled price was Rs.1600, at what price did she purchase the bag? 4. Priya driving his car at a speed of 45 km/hrs reaches her college 14 minute late. Next time she increase her speed by 5 km/hrs but finds that she is still late by 8 minutes. What is the distance of her college from her house? 5. In a bag there are 4 gold bands, 5 silver bands and 6 iron bands. 3 bands are drawn one by one. If the first band comes out to be of Gold, then 6 more gold bands are added to bag. After the 2nd draw no new bands are added. Find the probability that all the 3 bands drawn are of gold bands. A survey was conducted on 50 persons regarding their hobbies. Each person had at least one hobby among Singing, Dancing and Gambling. No person had a hobby other than these three hobbies. Atleast 18 people have Gambling as their hobby. At most 11 people have Dancing and Singing as their hobby. 6. If the number of persons who have Singing and Dancing as their hobby is the same as the number of persons who have only Gambling as their hobby, what is the maximum number of persons who have Singing as their hobby? 7. 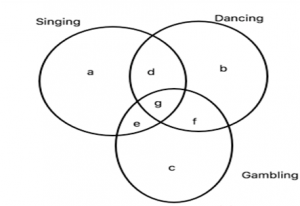 If the number of persons who have only Dancing as their hobby is the same as the number of persons who have exactly two hobbies, which of the following can be the number of persons who have only Singing as their hobby? 1. C) A do the work for 3 days + 3 days = 6 days, B work for 3 days and C work for 3 days. ⇒Due to withdraw of one gold band now there are only 3 gold bands is left. Also, there is no replacement done so, total number of bands becomes 14. Hence, 24/475 is the probability of all the 3 bands drawn are of gold bands. a+e will be atleast 3.
a+e will be atleast 1. 8 people – Bhanu, Himanshu, Bhuvan, Sheena, Amit, Nisha, Raina and Sahil lives on different floors of a building (numbered 1 to 8), but not necessarily in the same order. They earn different salaries. The one who lives on 5th floor earns Rs11,000. There are two floors between the one who earns Rs11,000 and on which Raina lives. Sheena earns Rs2,000 more than Raina. There are 3 floors between the floors of Raina and Bhanu. The one who earns Rs20,000 lives just above Bhanu. Himanshu lives on odd numbered floor but somewhere below the one who earns Rs11,000. Two persons live between Himanshu and the one who earns Rs28,000. Three persons live between Sheena and the one who earns Rs14,000. Sheena lives above the one who earns Rs14,000. Two persons live between Sahil and Bhuvan. One of Sahil or Bhuvan earns Rs14,000. Nisha lives above Sheena but not on top floor. Three persons live between Amit and the one who earns Rs17,000. The total salary of Bhuvan and Amit is Rs39,000. Amit earns more than twice the salary of Sheena. One person earns Rs33,000. 1. Who lives on 4th floor? 2. Who earns Rs 17,000? 3. How many people live between Nisha and the one who earns Rs33,000? 4. What is the total salary of Bhuvan and Nisha? 5. Who lives on top floor? 6. How many such symbols are there which is immediately followed by number and immediately followed by letter? 8. Complete the series: K9 X δ6M SAK ?